The fifth annual Suffolk Adult Learners’ Awards has taken place at University Campus Suffolk on 18.06.2015. Suffolk groups and individuals have been recognised for their hard work and outstanding achievements of adult learners’ over the past year. 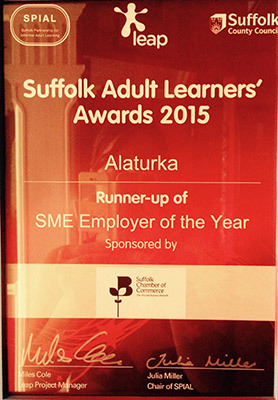 A total of 12 awards presented and we are thrilled to let you know that Alaturka was selected as a runner-up of the SME EMPLOYER of the YEAR award for 2015. The evening was presented by Lesley Dolphin from BBC Suffolk and our manager Semra Avcikaya attended the evening to receive the award. We would like to congratulate all the winners and a huge thanks to LEAP and all the sponsors of the event.